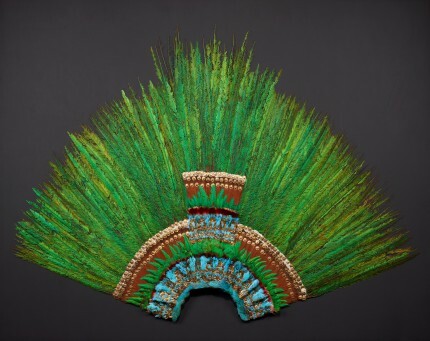 The Aztec feather headdress known as Moctezuma’s headdress or the Penacho has been restored and is now back on display at Vienna’s Museum of Ethnology. The headdress was cleaned and conserved with much success. The faded colors of the feathers have been brought back to vibrancy: feathers from the Squirrel Cuckoo that looked orange are now a deep brick red, the small blue Lovely Cotinga feathers that looked powder blue are now a brilliant turquoise, and the smaller quetzal feathers that looked the same powder blue as the Cotinga feathers are now their proper iridescent green, as are the 400 long Resplendent Quetzal tail feathers. A commission of historians, archaeologists and ornithologists from Mexico’s National Institute of Anthropology and History (INAH) and Austria’s Kunsthistorisches Museum spent two years studying the incredibly fragile piece, investigating its historical significance and documenting its condition. They focused on historical questions — its composition, the materials and technique used in its creation — and conservation issues — how to keep it from any further deterioration. 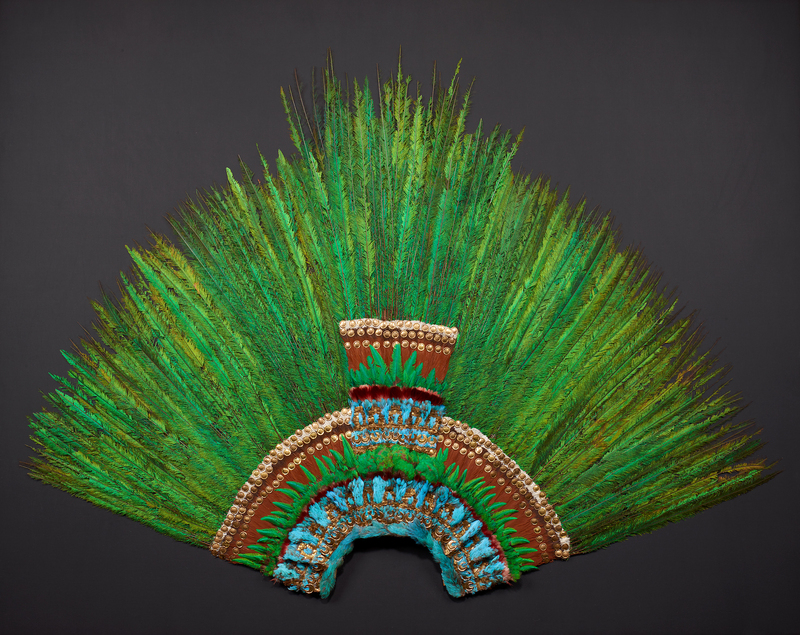 This is the last Aztec feather headdress to have survived, and people have been trying to ensure its survival for centuries. Conservators found and removed several old restoration attempts. They did keep a few springs added in the 16th century. They’re something of historical note in and of themselves, a testament to how long this gorgeous piece has been on display, starting with Archduke Ferdinand II’s extensive private collection at Ambras Castle in Innsbruck in 1575. 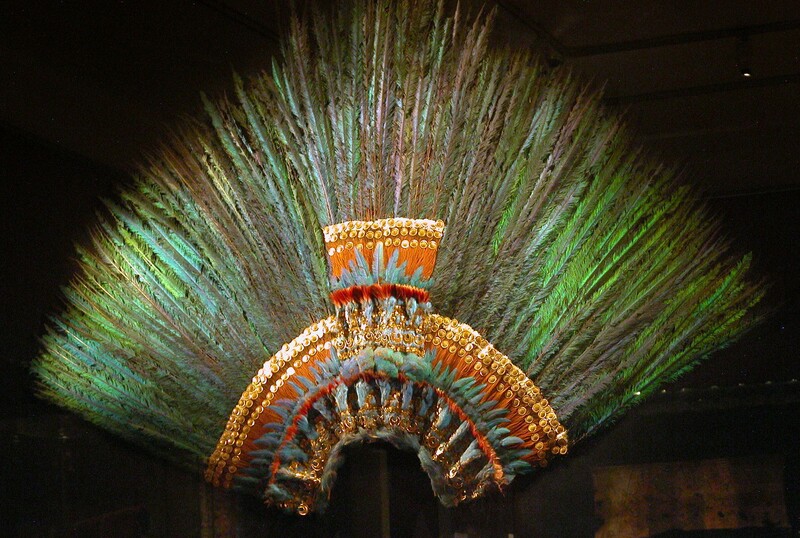 There was an agenda on the table other than cleaning and conservation, namely, could the headdress survive a trip to Mexico. It was once part of the regalia either of the last Aztec king Moctezuma II or of a high priest; the Penacho was either gifted to conquistador Hernán Cortés by the king or he looted it during the siege of Tenochtitlan in 1521. At some point thereafter it made its way to Europe where it was first documented in the collection of Ferdinand II, who in addition to being Archduke of Austria was also the nephew of Cortés’ boss, Spanish King and Holy Roman Emperor Charles V. Mexico figures half a millennium of absence is long enough and would like it back for a very long term loan. The Austrian museum authorities are amenable to the idea, but only if means of transportation can be found that will not damage the piece. Such means have not yet been found. The Museum of Ethnology constructed a display case that was custom-built to compensate for the vibrations caused by the footsteps of visitors walking around the room, because even such a small amount of movement could harm the delicate piece. They’ll have to invent something far more complex to protect the headdress from the motion of an airplane or a ship voyage. Although this isn’t likely to happen any time soon, Austria is definitely open to the prospect and talks are ongoing. Austria and Mexico are currently negotiating a new treaty on cultural exchanges. The Penacho will play a starring role in the discussions. This entry was posted on Thursday, November 22nd, 2012 at 9:49 AM	and is filed under Modern(ish), Museums, Renaissance. You can follow any responses to this entry through the RSS 2.0 feed. You can skip to the end and leave a response. Pinging is currently not allowed. How was it worn? straight across the top of the head or pressed up against the forehead or? Needless to say that he -again- took no pictures. Hard to tell, therefore, if he already saw this fancy dress on display. 1. It’s incredibly beautiful! And, praise to Austria for working on trying to get it back to it’s home. 2. I didn’t skip. Miss a Livius Drusus word? Never! You are far too kind. Well, we raisin sandwich eating history nerds have to be sure we don’t miss anything good. It’s nice to know that a part of my ancestry still exists. Too bad that we will never really quite know the true meanings of some of these precious artifacts. Truly a low blow to Mexico’s rich history. This Penacho belongs in Mexico, it was taken along with tons of other precious and worthy items that belonged to Mesheeka (Mexica) Royalty. Austria, thank you for taking care of it, but being there reminds us all of the devastating conquest of one of the world’s most beautiful ancient cities, Tenochtitlan, at the hands of the Spanish crown. Returning it, would give us some peace!